A SECURITY guard caught masturbating near skimpily dressed cheerleaders at a National Football League (NFL) game has been sacked. The man is seen with his hands in pants in full view of thousands of spectators.The New York Post reported one horrified woman fan wrote on social media: “So clearly Elite Security nor the San Diego Chargers care that they have a masturbating security guard at the game. What exactly the contractor, an employee of Elite Security, was doing in the midst of the San Diego Chargers-Oakland Raiders game is not entirely clear. The video shows the guard, a man, making motions with his hand in his pocket without exposing himself. NFL Security Guard Fired After Allegedly Jerking Off During A Game — See The Proof! San Diego Chargers Security guard was openly masturbating RIGHT IN FRONT of us during the game, while watching the cheerleaders jump up and down!!! I can’t believe this was allowed. Such a complete disregard for women’s rights and public decency! Today, 68,000 NFL fans in attendance at a football game and the rest of the nation (hopefully, most age 18 and up) is processing the unsettling revelation that a security guard masturbated near San Diego cheerleaders. This actually happened, America. 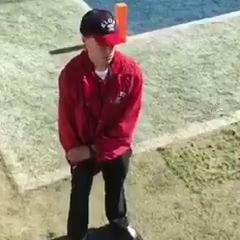 December 20, 2016 3:14pm EST December 20, 2016 3:04pm EST The security company is investigating an incident in which a man appeared to be masturbating on the sideline during the Chargers’ loss to the Raiders on Sunday.